Blog about the Hui people. Chinese poetry is a big subject. Famous Chinese Song dynasty poetess Li Qingzhao. I did a brilliant online course on The European Discovery of China, with the wonderful Professor Dolores Folch. A fantastic resource, and it is free! 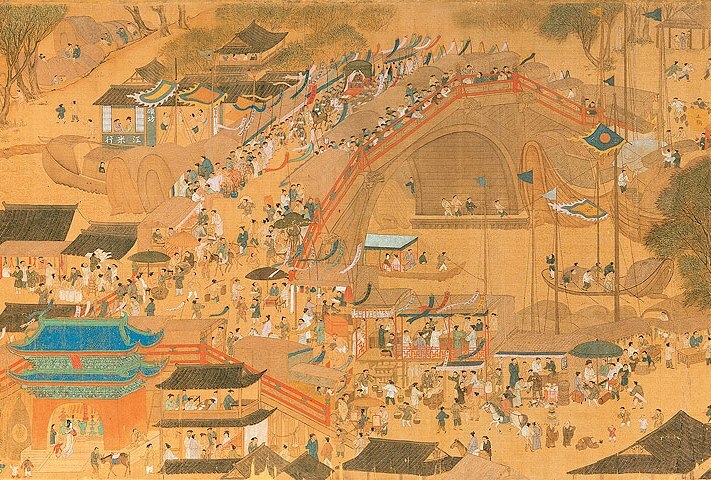 Amongst lots of excellent material, it uses the QingMing festival handscroll (Ming dynasty version). China: As History is my Witness, a very interesting series on how history informs today’s China. The Reith Lectures 2008 opened up Chinese Vistas. In Our Time described the introduction and impact of Chinese legalism, Daoism; Confucianism, the Han Synthesis, early sources of Chinese History; Silk Roads; Warring States. A History of Ideas included Ancestor Worship and Creation Myths including Daoism. A History of the World in 100 Objects included Zhou bronze bell; Silk Road wall painting. Chinese Characters. – from the female Emperor Wu Zetian to Bruce Lee and many more! BBC’s Wild China series is available on DVD. Channel 4’s Between Clouds and Dreams, & Beyond the Clouds. A rather nice series of books on Chinese Culture – compact format, not expensive, colour pictures and dual English & Chinese text. There are lots of different subjects, from poetry to lanterns, bridges to pagodas, scholar objects to the Tea-Horse Road. For example, here are 3 on clothing. They are available from Hanshan Tang (selected titles) and Purple Culture (all titles). Handling old books – definitely no gloves! A Bite of China, from CCTV, so perhaps take with a pinch of C5H8NO4Na. My friend Anita teaches Tai Chi in Surrey, and Sylvia in Kent at Hayes and West Wickham.